Nearly every morning of this trip, I have woken up before the sunrise. When we were driving out here, I started to notice this calm that came over me. It was like someone had suddenly released the string that was gently squeezing my brain tighter each day. Getting up to watch the sunrise has reinforced that calm in me. I quite like the feeling of not having the small hum of anxiety follow me around at all times. So, the one thing I really want to take back with me is the clarity and space I feel in my brain. This whole trip’s theme has been space. Space each morning for the sunrise. Spacial relationships in art, architecture and design. Space to get things done. I think having that in daily life is possible, you just have to be given a glimpse of it first. Then comes the task of working towards that. I know the challenge in keeping this mindset is that cities are overwhelming and overstimulating. There’s always something to do. But, then again nearly 95% of those FOMO inducing activities are just perceived as important and not actually vital. It’s tough to remember that when I’m confronted with the situation. Conjecture and theory on how I’ll keep this newfound space in my head and life is great. But, it’s nothing without a plan. The sunset has worked well here to remind me, but I’m not sure if that will work in Austin or not. We don’t necessarily have the best vantage point for the sunrise at our place. Going to Donald Judd’s private residence yesterday in Marfa, TX gave me this renewed sense of validation. The guy placed a huge deal of importance, some might say to the point of obsession, on spacial relationships. On space. Walking through his library, I counted at least 10 or more books revolving around space in art, human life, architecture, design, and other areas. He said that he would spend as much time cultivating new ideas for works as he would arranging his existing installations. All to achieve the best possible spacial relationships. He was also apparently highly concerned with symmetry in his work and living space. If it could be symmetrical, he would do it. You can tell by looking at the compound in Marfa, TX he constructed and lived in. Anyone who discussed his work placed an emphasis on looking beyond the work itself, and to observe how it fit in with the building and nature around it. I found the part about how it fit into nature especially fascinating. When we went out to the Chinati Foundation, this sense of art in nature struck me as even more of a commentary on how humans, and human creation, stick out like a sore thumb in the natural world. Most of Judd’s work is highly angular, and squares are a recurring theme. And, upon observing nature you generally don’t see this angularity, hardness, or apparent symmetry. When we went to visit Sonora Caverns on the journey out here, I observed this opposition between humans and nature in some of the rubble we got to hold from the cave walls. The excavators of the caverns had chiseled away parts of the cave wall, and there were softball-sized pieces of the rubble that visitors could touch. You are not supposed to touch any of the cavern walls, because human interaction can completely stop the natural growth of the cavern. On one side of the piece of rubble I held, I saw what nature had created. Petrified Coral, which is full of a vast array of curved smooth surfaces formed by water over millennia. On the other side, you had the human touch. Hard angular lines made by a chisel, hammer, and brawn. It was quite the vast metaphor encased in this small natural object. On first glance, the two opposing forces don’t seem to mix. 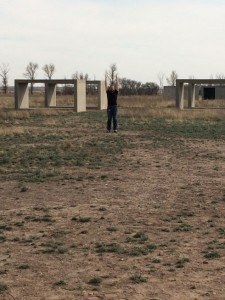 When we went out to the Chinati Foundation, I wondered if Judd saw the same relationship between man and nature. I saw the metaphor in his art and installations, only he was taking it further. It seemed to me that he was showing humanity a way to coexist in nature by using purposeful and complimentary design. I’m always refining my own theory of how we all fit into this place around us that we keep chiseling away at. However, it was incredible to me that my trip was book ended by the work of an artist who was so devoted to the craft of space in art and nature, and our relationship to it. Thanks Judd.